When designing a bathroom for people with limited physical capacity, it is essential to provide the necessary assistive aids for the users. Including the right assistive aids will make the users more self-sufficient which improves their quality of life and at the same time makes the work of the helpers easier. 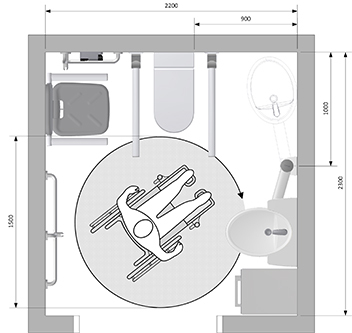 ROPOX bathroom concepts illustrate how you can design flexible, functional, stable and ergonomic bathrooms that are customized to the needs of the elderly and disabled. 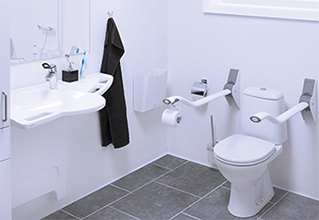 You will find washbasins, grab rails, shower seats, toilet lifter, support arms and nursing benches in our range and this allows you to create complete bathrooms with ROPOX products which are known for their elegant, ergonomic and functional design that meet the needs of both users and their carers. Our products use modern welfare technology because it makes the elderly and people with mobility disabilities more independent, and that means that they can get assistive aids that make it easier to wash their hands, use the toilet and take a bath. Not only does it make everyday life more comfortable for the user, but it also ensures a better working environment for the helpers. For example, you can get ergonomic and sturdy washbasins that you can adjust in height, slide sideways or swing towards to toilet so the user can wash hands while sitting down. You can also mount arm supports by the toilet or use a toilet lifter if there is a need for extra support to get on and off the toilet. All our bathroom solutions are made in close cooperation with users, nursing assistants, and occupational therapists to make sure they take all the needs of the users and carers into account. Regardless if the user is using a wheelchair, is walking impaired or in any other way has limited physical ability, a bathroom with ROPOX products can make everyday life easier. The right assistive aids can also make a significant difference to the carers. Partly because the physical strain is reduced as the number of manual lifts are minimized, and they can provide care in healthy working positions, and partly because they get more time for other tasks when the users become more self-sufficient. Bathrooms for people with mobility disabilities have to be sturdy and ergonomic to make the users feel safe when using the bathroom. That is why all our products are tested and approved according to relevant standards. This means that you can rely on ROPOX products to last for years. 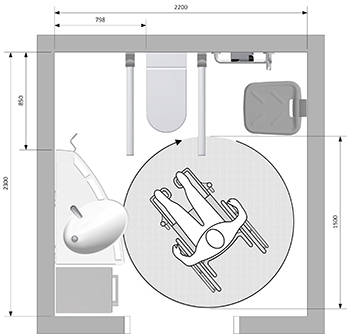 ROPOX concepts make it possible to create bathrooms that are accessible for all. 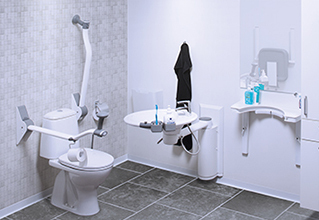 For a bathroom to provide the optimum conditions for a user with a mobility disability and at the same time ensure a healthy and good working environment for the carer, it must be designed with accessibility in mind. This means that it is possible for all people – regardless of their level of mobility – to use the bathroom. A way of doing it is to use products that are height adjustable, flexible and solid. Bathroom solutions with the Swing washbasin Bathrooms with the Swing washbasin are ideal for wheelchair users and walking-impaired persosn as they can use the washbasin while seated to prevent fall injuries. As the washbasin is height adjustable and is able to swing, it is easier to use and it also gives wheel chair users better room to manouver a wheelchair in the bathroom. If you design a bathroom with limited space, the flexible Swing washbasin will be ideal as you obtain more space and improved mobility. The Support washbasin is solid and especially suitable for walking-impaired persons. If you use the washbasin in combination with the shower seat and toilet support arms, the user gets a great support and can be safely seated in daily bathroom situations. The washbasin is height adjustable and can also slide sideways which makes it unique, and furthermore, it can be adjusted specifically for the individual user’s needs. Increased self-reliance – The users will be increasingly self-reliant in the bathroom which gives them more privacy, more independence and improved quality of life. Less need for support from caregivers – The need for assistance from the nursing assistants are reduced, and the caregivers get more time for other tasks. More space – Optimum use of space in both large and small bathrooms. In new construction projects, it can result in significant savings when the space utilization is optimized – naturally without compromising on product functionalities. Improved hygiene – With easy access to the washbasin comes improved hygiene. The practical design of the product makes it easier to clean and prevents the accumulation of dust and dirt. Improved working conditions – It is possible for the user and the nursing assistant to work closely together, and the improved mobility provides the nursing assistant with excellent working conditions as heavy lifts are reduced, and it is easy to adjust the bathroom products to correct working height when working with the user in the bathroom.